Formats for original SPI Games. These questions can vex experienced SPI gamers and collectors. Below is a thumbnail sketch to track various formats, with general timelines of when each was available. If the format is hyperlinked, it will take you to list of the games in that format. On the menu list at the top of the page, I try to take you into detail of the format changes at SPI. I've backed these up with a quotes from articles from S&T and Moves. This is a work in progress: as of July 7, I have all but completed the table below. Below: a brief overview of each format phase, including links to lists of what was published in each format. Note - each of the links in this table will open as a new tab. Close it to return to this page. All S&T and Ares games. 1969- 1982 The original format for a direct mail company. Remember, though, that "Games in issues prior to number 18 contain only written rules, instructions and/or lists of units bound-in [to the magazine] but no finished components." For example: Crete (issue 18) is bound into the magazine itself (including the mapsheets). Test Series Games 1969-1970(?) The Test Series Games were the original efforts by the formative band of would-be designers that came together around S&T magazine in the early days. Poultron Press was organized to improve the games offered to wargamers, and break the 'one game a year' stranglehold AH exerted on the hobby. [Article] Poultron Press first advertised in S&T 18 - [Ad from S&T 20]and the response was overwhelming. The rules were not typeset. The maps were black & white, on very thin paper. Counters were essentially printed on construction paper, unmounted. The response was overwhelming! Check out all the great pictures here! S&T 19 - 25 (see notes) 1969-1971 Purchased by Dunnigan and Simonsen and incorporated, the changes for S&T begin with the birth of SPI. 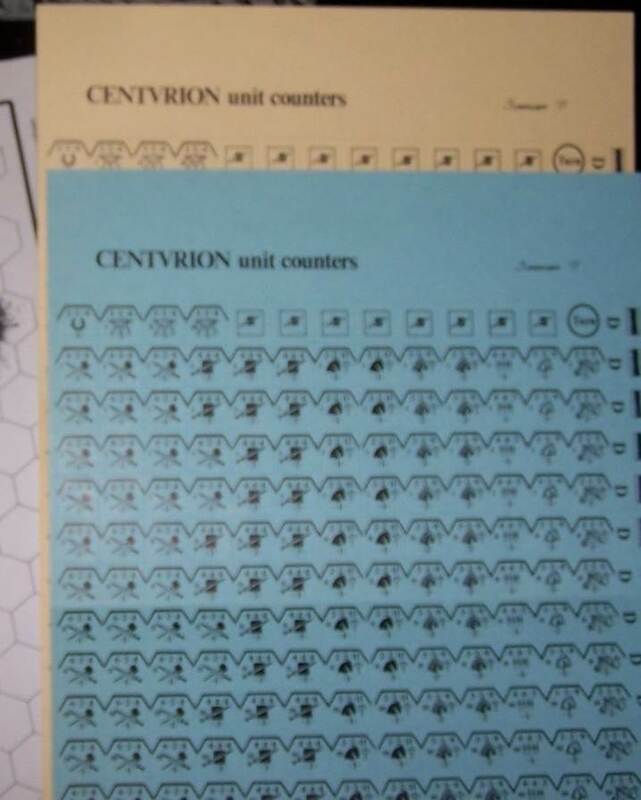 The games in S&T from 19 to 25 came with components but the counters were uncut and unmounted. These counters require the buyer to glue them to pressboard or tileboard, and then cut them. NOTE: Once SPI begins mounting counters (issue 26 on), it retrofits the games from 19 to 25 [not including T-34]* with mounted counters. *T-34 has no counters, ; and France, 1940 had sold to Avalon Hill. (19 - 25 reprints retrofit) 1971-1982 All SPI games from issue 26 were mounted. Early purchases of these games could buy the counters, and people buying the games after the mounted markers became available might get both the mounted and unmounted counters. Aug 1973 Introducing the plastic tray, inserted into the White Box, removing the 'disappearing counters' problem of Mk I and MK I.5. This tray is actually the base of what would become the flat pack - see picture on Chapter 3, WHITE BOXES. July 1978 Introduced as the Mark III box, and referred to as a box in the catalogs, the 'flat pack' is the iconic image of SPI games to most of us. Announced in S&T 39 (July/Aug 1973). Covered in detail under Chapter 4. 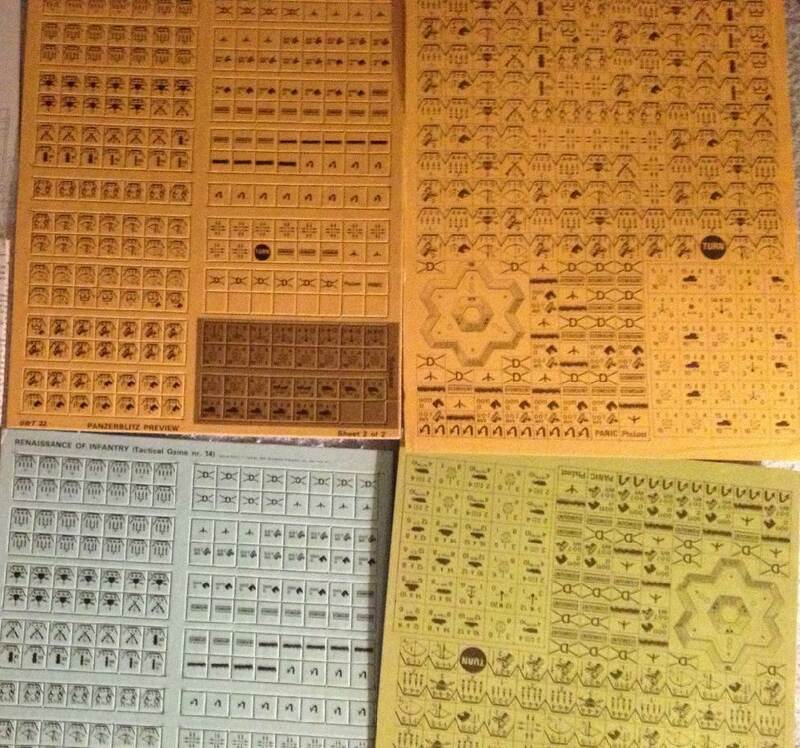 See the link FLAT PACKS at top of page. July 1979 In 1975, SPI introduced the Quadrigame - smaller game sets with smaller maps - but in 4 colors! Covered in detail on Chapter 5 - QUADS link at top of page. July 1979 Folders for holding the map and rules. Allowed for a nicely printed cover and some details on the back. Generally these were used for the individual games that made up the QuadriGames. There were also 'Strategy & Tactics Folios' and a special 'Lord of the Rings Folio' for the two smaller games in the Middle Earth game. 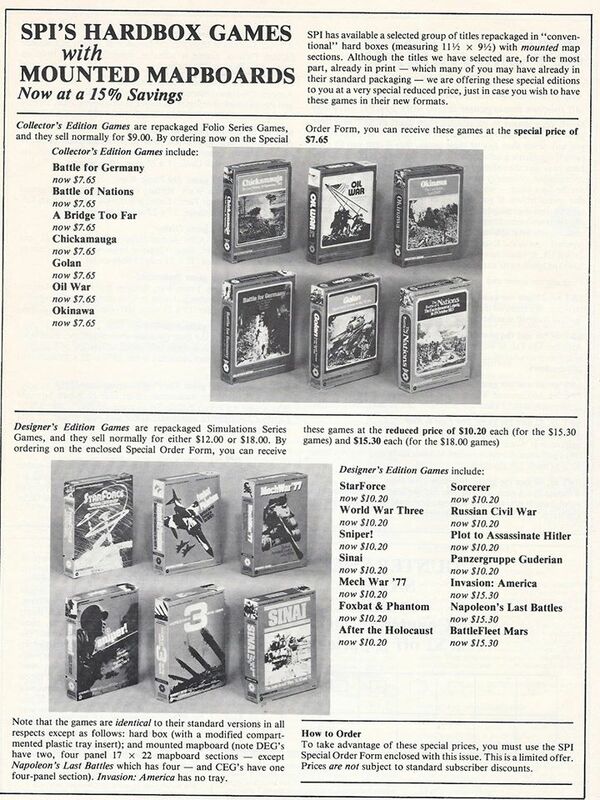 The July 1979 catalog no longer breaks out the Folio games as having a 'folder' simply as 'smaller' games in a plastic bag. Multiplayer non-wargame SPI game in a 2" bookshelf boxes with mounted map boards and a counter tray. (First announced in S&T 53, page 2, Nov/Dec 1975 for Russian Civil War. Game later published on May 28, 1976. ) First full discussion S&T 54, page 22. List Here July 1978 - Now all games in print that need a new printing of the game will get a 2 or 4 inch cardboard box with full color cover. Monster/Double games get 4" boxes. (Descent on Crete appears to be the last flat pack game. Few boxed versions of this version exists.) Any game in production once the 2" boxes begin can become a boxed game. List Here July 1978 - As above, except 1600 t0 2000 counter games (most Monsters) get 4" boxes. Atlantic Wall, which came out as change over was occurring, started life as a double flat pack, but quickly became a 4" box. Full list here March 1979 - These should be called 'The Killers.' In an attempt to compete with Steve Jackson and TSR's low cost games, these packages took folio games and folded them again to fit in a 5.5 x 8.5 plastic bag, and sell for $3.95. Crazy!